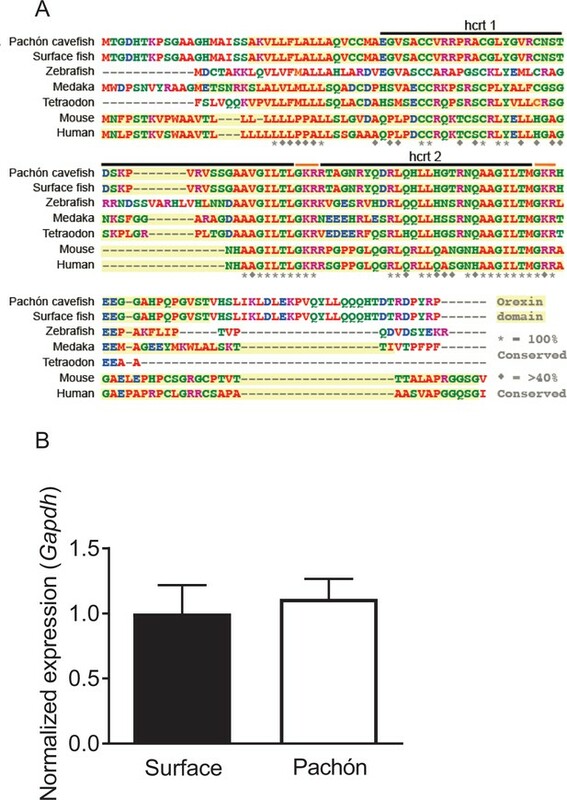 Hypocretin transcript and peptide levels are elevated in Pachón cavefish. (A) Representative images of surface fish and Pachón cavefish (B) Sleep duration is significantly reduced in Pachón cavefish compared to surface morph (Unpaired t-test, t = 5.56, n = 26, p<0.0001). (C) Expression of hcrt normalized by GAPDH in adult whole-brain extracts is significantly enhanced in Pachón cavefish compared to surface fish (Unpaired t-test, t = 11.15, n = 8, p<0.0001). (D) HCRT neuropeptide signal is significantly increased in Pachón cavefish compared to surface fish (Unpaired t-test, t = 5.94, n = 8, p<0.001). E. The number of HCRT-positive cells in the hypothalamus is significantly increased in cavefish compared to surface fish (Unpaired t-test, t = 9.984, n = 8, p<0.0001). (F–I) Representative 2 μm confocal images from coronal slices of surface fish or Pachón brains immunostained with anti-HCRT (green) and DAPI (white) (F) Surface whole brain coronal slice. (G) Pachón whole brain coronal slice. (H) Surface fish dorsal hypothalamus containing HCRT positive cells (I) Pachón cavefish dorsal hypothalamus containing HCRT neurons in view. Scale bar denotes 500 μm (F,G); 50 μm (H,I). This source file includes the analysis for comparisons between surface and Pachón cavefish for sleep duration (Figure 1B), hcrt expression (Figure 1C), the number of cells expression HCRT (Figure 1D), and the intensity of HCRT signal (Figure 1E). HCRT sequence is identical between surface fish and Pachón cavefish. (A) Sequence alignment for HCRT in A. mexicanus reveals a homology of 35–48% percent identity compared to other fish species including zebrafish and medaka, and a 35% percent identity conserved compared to mammalian HCRT. (B) Housekeeping gene used for all q-PCR experiments are not significantly altered between Surface and Cavefish (Unpaired t-test, p=0.972). Expression was normalized to Surface fish. Quantification of qPCR housekeeping genes and fluorescent intensity between surface and cavefish. This source file includes quantification of qPCR differences for the housekeeping gene Gadph (Figure 1—figure supplement 1B) and comparison of fluorescence intensity between surface and Pachón fry (Figure 1—figure supplement 3C). HCRT peptide levels are increased in Pachón cavefish. (A) Surface fish whole brain from sagittal 2 μm confocal slice (B) Pachón cavefish whole brain sagittal 2 μm confocal slice. (C) Surface fish hypothamus sagittal 2 μm confocal slice. (D) Pachón cavefish hypothalmus 2 μm confocal slice. Hypocretin levels are increased in early development in Pachón cavefish. (A) Five days post fertilization whole-mount surface fish immunostained with anti-HCRT (green) and DAPI (white). (B) Whole mount four dpf Pachón cavefish immunostained with anti-HCRT (Green) and DAPI (white). (C) HCRT neuropeptide levels are significantly increased in five dpf Pachón larvae compared to surface (Unpaired t-test, t = 3.17, df = 10, p<0.01). 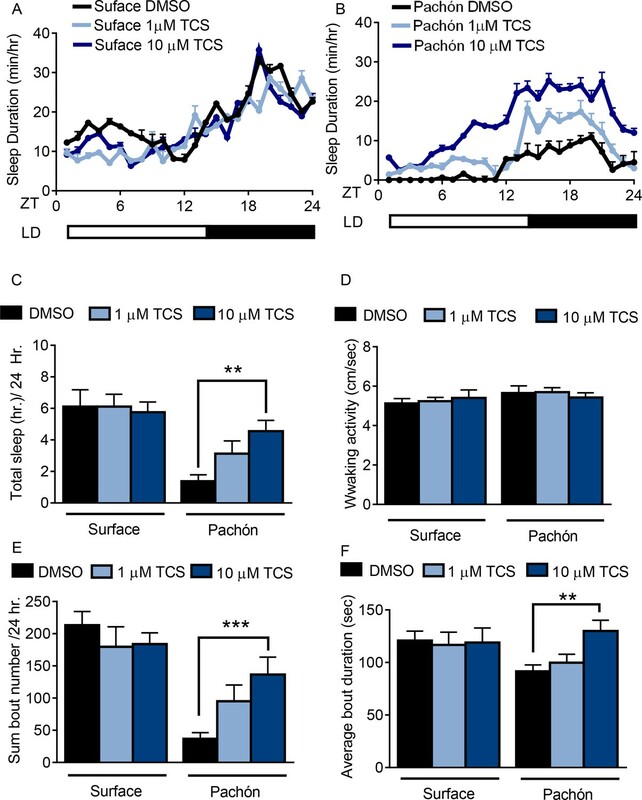 Pharmacological inhibition of HCRT Receptor two promotes sleep in Pachón cavefish. (A,B) Twenty-four hour sleep profile in surface fish (A) Pachón cavefish (B) treated with DMSO (black), 1 μm TCS (light blue) or 10 μm TCS (dark blue). (C) TCS treatment does not affect total sleep duration in surface fish (1 μM p>0.999, n = 12, 10 uM P>0.941, n = 12). Pachón cavefish teated with 1 μM TCS trended towards increased sleep (p>0.178, n = 12) while treatment with 10 μM significantly increased sleep (p<0.01, n = 13; F(1, 73)=25.00,) compared to control treated fish. (D) Waking activity was not significantly altered in surface fish or cavefish or in response to drug treatment, 2-way ANOVA, (F(1, 73)=2.73, p>0.103, n = 79) (E) Treatment with TCS did not affect average sleep bout duration in surface fish (1 μM TCS, p>0.430, n = 12; 10 μM TCS, p>0.518, n = 12) Treatment of Pachón cavefish with 1 μM TCS trended towards increased bout duration, p>0.051, n = 12, while 10 μM TCS treatment significantly increased bout duration in Pachón cavefish, (p<0.01, n = 13; F(1, 73)=47.42). (F) TCS treatment did not affect total sleep bout number in surface fish 1 μM TCS, p>0.976, n = 12; 10 μM TCS, p>0.998, n = 12). In Pachón cavefish, treatment with 1 μM TCS did not affect sleep bout number (p>0.828, n = 12). Treatment with 10 μM TCS significantly increased bout duration in Pachón cavefish,(p<0.001, n = 13; 2-way ANOVA, F(1, 68)=3.309). Data analysis comparing the effects of 1 um and 10 um TCS compared to controls in surface fish and cavefish for sleep (Figure 2C), waking activity (Figure 2D), total bout number (Figure 2E), and average bout duration (Figure 2F). Panel of pharmacological HCRT antagonists reveals wake-promoting role of HCRT in juvenile cavefish. (A) Two SORAs and one DORA were used to inhibit binding of HCRT to its receptor. (B) Total sleep is not significantly altered in surface fish with the treatment of HCRT antagonists (TCS, p=0.814, n = 18; Suvorexant, p=0.865, n = 18; EMPA, p=0.972, n = 19). Pachón cavefish significantly increased total sleep in response to HCRT antagonists (TCS, p=0.004, n = 18; Suvorexant, p=0.032, n = 19, EMPA, p=0.027, n = 18; 2-way ANOVA, F(1, 135)=43.70, p<0.0001). 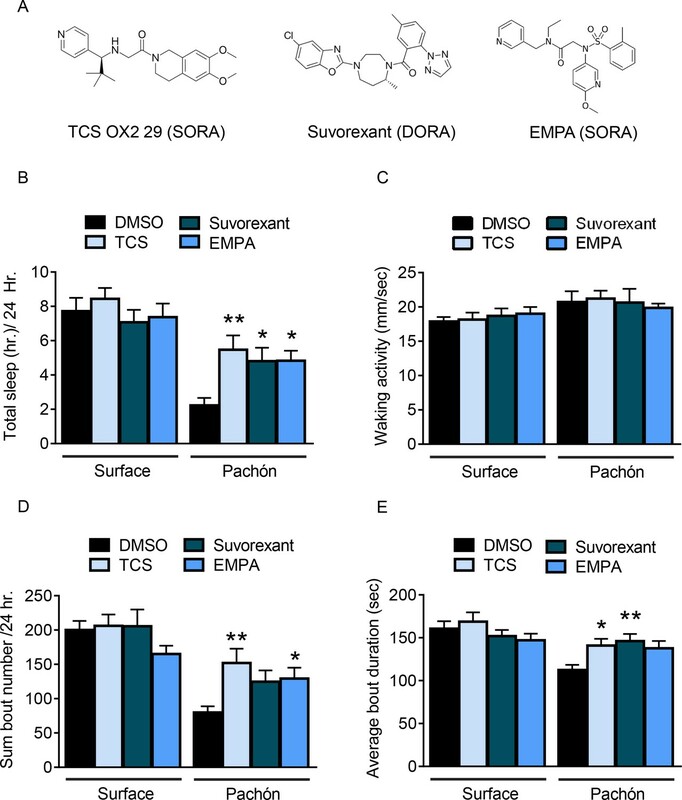 (B) Waking activity was not significantly altered in any fish or in response to drug treatment, Surface TCS, p=0.996, n = 18; Suvorexant, p=0.925, n = 18; EMPA, p=0.816, n = 19; Pachón, TCS, p=0.980, n = 18; Suvorexant, p>0.999, n = 19; EMPA, p=0.917, n = 18; 2-way ANOVA, (F(1, 135)=7.21, p=0.008) (C) The total number of sleep bouts over 24 hr of drug treatment did not significantly change in surface fish (TCS, p=0.814, n = 18; Suvorexant, p=0.865, n = 18; EMPA, p=0.972, n = 19). Total sleep bouts were significantly increased in Pachón cavefish with TCS, p=0.002, n = 18; and EMPA, p=0.041, n = 18, Suvorexant trended towards significance, p=0.071, n = 19 (2-way ANOVA, F(1, 135)=45.27, p<0.0001). (D) Average sleep bout length was not significantly different in Surface fish treated with HCRT antagonists (TCS, p=0.822, n = 18; Suvorexant, p=0.805, n = 18; EMPA, p=0.236, n = 19). Pachón cavefish significantly increased their average sleep bout lengths with TCS, p=0.039, N = 18; and with Suvorexant, p=0.009, n = 19. EMPA trended towards significance, p=0.078, n = 18 (2-way ANOVA, F(1, 135)=14.06, p=0.0003). This source file includes analysis of treatment with the HCRTR inhibitors Suvorexant, TCS, and EMPA on total sleep duration (Figure 3B), waking activity (Figure 3C), total number of sleep bouts (Figure 3D), and average sleep bout duration (Figure 3E). HCRT agonist partially alters sleep behavior in juvenile surface fish, but not Pachón cavefish. (A) Total sleep was significantly reduced in surface fish (p=0.001, n = 26) while there was no effect with YNT-185 treatment in Pachón cavefish (p=0.997, n = 16; 2-way ANOVA, F(1,77)=25.81, p<0001). 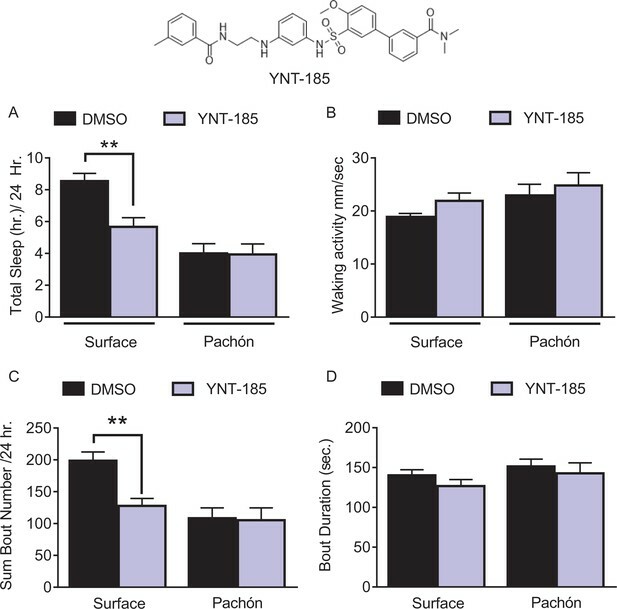 (B) Waking activity was not significantly altered between surface fish (p=0.228, n = 26) or Pachon cavefish (p=0.716, n = 16) or with treatment of YNT-185 among either treatment groups (2-way ANOVA, F(1,77)=0.133, p=0.715). (C) Total sleep bouts were significantly reduced in surface fish with YNT-185 treatment (p=0.0005, n = 26). However, there was no alteration in sleep bouts in Pachón cavefish (p=0.989, n = 16; 2-way ANOVA, F(1,77)=14.78, p=0.0002). (D) Average Sleep bout duration was not significantly changed in either surface fish (p=0.391, n = 26) or in Pachón cavefish (p=0.820, n = 16; 2-way ANOVA, F(1,77)=2.06, p=0.155). Inhibition of HCRT signaling increases sleep in larval cavefish. This source file includes analysis of 1 um and 10 um TCS treatment on total sleep duration in surface fish and Pachón cavefish (Figure 3—figure supplement 1B). HCRTR2 blockade selectively increases sleep in Pachón cavefish. (A) Representative images of surface (top) and Pachón (bottom) fish at 25 dpf. (B) TCS treatment did not affect sleep duration in surface fish (1 µM, P=0.782, n=18, 10 µM P=0.891, 30 µM, P=0.791 n=18) while Pachón cavefish increased total sleep duration in response to 10 and 30 µM TCS treatment (1 µM, P>0.116, n=17; 10 µM, P<0.031, 30 µM, P=0.02 n=18, 2-way ANOVA, F(2,88)=12.178). C-D. Twenty-four hour sleep profiles of surface fish (C) and Pachón cavefish (D). This source data file includes quantification of the effects of the HCRT agonist YNT-185 on total sleep duration (Figure 3—figure supplement 2A), waking activity (Figure 3—figure supplement 2B), total bout number (Figure 3—figure supplement 2C), and average bout duration (Figure 3—figure supplement 2D). Transient knockdown of hcrt increases sleep in four dpf cavefish. (A) Morpholino knock-down of hcrt does not alter total sleep in surface fish, p=0.640, n = 34, while in cavefish total sleep time was significantly increased with hcrt knock-down, p=0.0002, n = 40; 2-way ANOVA, F(1,133)=45.82, p<0.0001 (B) Waking activity was not significantly altered in either surface fish (p=0.343, n = 34) or Pachón cavefish (p=0.084, n = 40; 2-way ANOVA, F(1, 133)=5.807). (C) Total number of sleep bouts in surface fish was not significantly different from injected controls, p=0.459, n = 34. While in Pachón cavefish, total sleep bouts over 24 hr was significantly increased in hcrt MO fish compared to control fish (p=0.0004, n = 40; 2-way ANOVA, F(1,133)=8.295, p=0.004). (D) Average sleep bout duration was not different between controls and hcrt MO injected surface fish (p=0.081, n = 34). 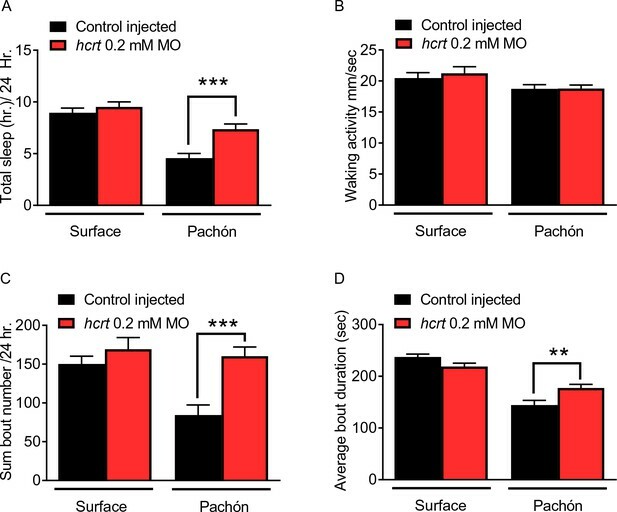 There was a significant increase in average bout duration In Pachón hcrt MO injected fish compared to their respective controls (p=0.004, n = 40; 2-way ANOVA, F(1,133)=13.61, p=0.0003). Transient knockdown of hcrt increases sleep in 4 days post fertilization cavefish. This source file includes analysis comparing the effects of hcrt morpholino treatment on sleep duration (Figure 3A) waking activity (Figure 3B), total number of sleep bouts (Figure 3C), and average sleep bout duration (Figure 3D). Morpholino injections do not affect survival in development. (A) No significant difference in surface fish survival from embryo injection to 96 hr post fertilization (Kruskall-Wallis, p=0.719, Dunn’s post test, Wild Type vs. Scramble MO, p=0.862, Scramble MO vs. hcrt MO, p=0.701). (B) Pachón fish survival from embryo injection compared to controls up to 96 hr post fertilization (Kruskall-Wallis, p=0.429, Dunn’s post test, Wild Type vs. Scramble MO, p=0.299, Scramble MO vs. hcrt MO, p=0.206). The effect of morpholino injection on survival in surface fish and cavefish. This source file includes data analysis quantifying the effects of morpholino injection on survival in surface fish (Figure 4—figure supplement 1A), and Pachón cavefish; Figure 4—figure supplement 1B over the first 96 hr post fertilization. Genetic silencing of subsets of HCRT neurons selectively increases sleep in Pachón cavefish. (A) Surface UAS-BoTx-BLC-GFP (B) Surface hcrt:GAL4-UAS-BoTx-BLC-GFP (C) Pachón UAS-BoTx-BLC-GFP (D) Pachón hcrt:GAL4-UAS-BoTx-BLC-GFP (E) Neuronal silencing of HCRT cells did not alter total sleep duration in surface fish (Wild Type*UAS-BoTx-BLC-GFP, p=0.989, n = 23; UAS-BoTx-BLC-GFP* hcrt:GAL4-UAS-BoTx-BLC-GFP, p=0.713, n = 14). 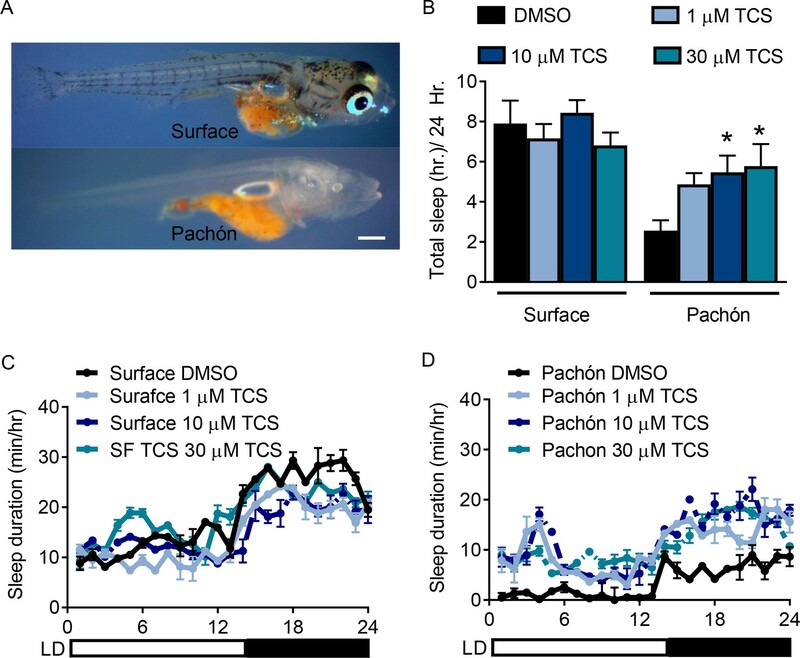 Pachón cavefish increased their total sleep when HCRT cells were silenced (Wild Type*UAS-BoTx-BLC-GFP, p=0.667, n = 21; UAS-BoTx-BLC-GFP* hcrt:GAL4-UAS-BoTx-BLC-GFP, p=0.0426, n = 15; 2-way ANOVA, F(1,91)=65.68, p<0.0001). (F) Waking activity was not altered in either Surface or Pachón cavefish with neuronal silencing of HCRT (Surface fish Wild Type*UAS-BoTx-BLC-GFP, p=0.616, n = 23; UAS-BoTx-BLC-GFP* hcrt:GAL4-UAS-BoTx-BLC-GFP, p=0.642, n = 14; Pachón Wild Type*UAS-BoTx-BLC-GFP, p=0.587 n = 21; UAS-BoTx-BLC-GFP* hcrt:GAL4-UAS-BoTx-BLC-GFP, p=0.612, n = 15; 2-way ANOVA, F(1,91)=0.206, p=0.650). (G) Regression analysis revealed there was a subtle trend of increased sleep with more HCRT neurons silenced as quantified with GFP signal (R2 = 0.091, p=0.314, n = 14). The same regression analysis in Pachón cavefish revealed a much more robust correlation to increased sleep in more silenced HCRT cells (R2 = 0.229, p=0.0871, N = 15). This file contains analyses quantifying the effects of HCRT neuron silencing on total sleep duration (Figure 5E), and waking activity (Figure 5F). The regression analysis determining the relationship between the number of HCRT neurons silenced and total sleep duration is depicted in Figure 5G. Genetic silencing of subsets of HCRT alters sleep architecture in Pachón cavefish. (A) Total sleep bouts were not significantly altered in surface fish when HCRT cells were silenced (Wild Type*UAS-BoTx-BLC-GFP, p=0.561, n = 23; UAS-BoTx-BLC-GFP* hcrt:GAL4-UAS-BoTx-BLC-GFP, p=0.636, n = 14). When HCRT cell were silenced in Pachón cavefish there was a significant increase in their total number of sleep bouts (Wild Type*UAS-BoTx-BLC-GFP, p=0.561, n = 21; UAS-BoTx-BLC-GFP* hcrt:GAL4-UAS-BoTx-BLC-GFP, p=0.031, n = 15; 2-way ANOVA, F(1,91)=32.43, p<0.0001). 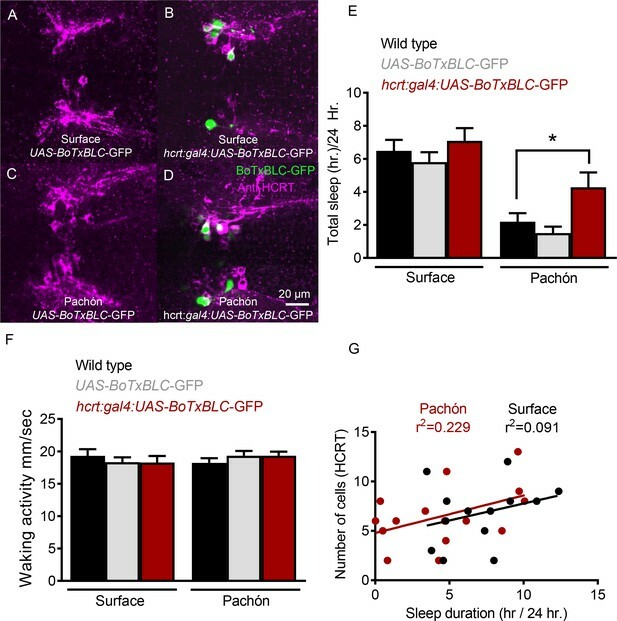 (B) Sleep bout duration was not changed in either Surface fish or Pachon cavefish when HCRT neurons were silenced (Surface Wild Type*UAS-BoTx-BLC-GFP, p>0.999, n = 21; Surface UAS-BoTx-BLC-GFP* hcrt:GAL4-UAS-BoTx-BLC-GFP, p=0.743, n = 15; Pachón Wild Type*UAS-BoTx-BLC-GFP, p=0.401, n = 21; Pachón UAS-BoTx-BLC-GFP* hcrt:GAL4-UAS-BoTx-BLC-GFP, p>0.999, n = 15;2-way ANOVA, F(1,91)=3.886, p=0.052). 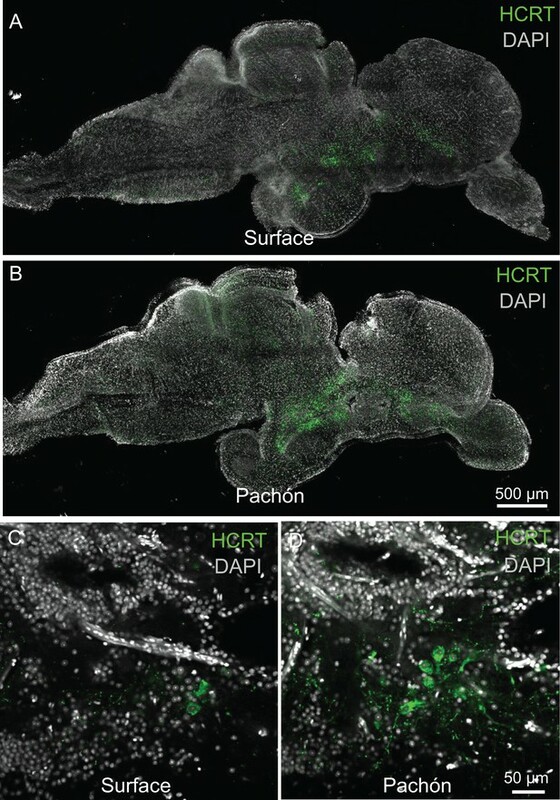 This source file contains analysis of total bout number (Figure 5—figure supplement 1A), and bout duration (Figure 5—figure supplement 1B) in fish with genetically silenced HCRT neurons. 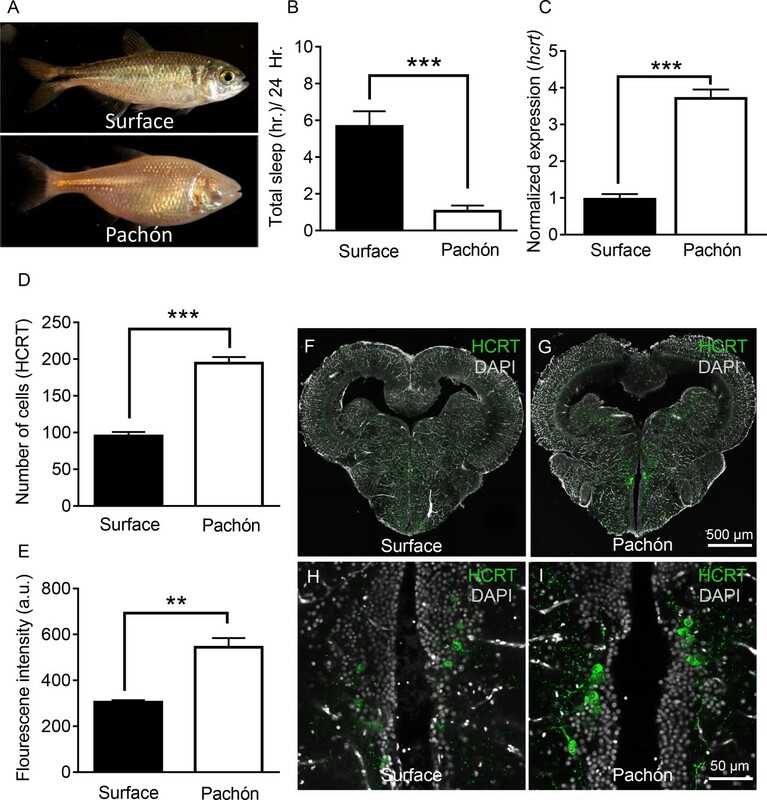 Chemical ablation of mechanosensory lateral line reduces HCRT levels in Pachón cavefish. (A-D). Photomicrographs of surface fish cranial regions stained with DASPEI to reveal lateral line mechanosensory neuromasts. Treatment with gentamicin ablates lateral line neuromasts in surface fish (B) and Pachón cavefish (D) (E) Gentamicin treatment has no significant effect on hcrt expression in surface fish (p>0.635, n = 8) while in Pachón cavefish gentamicin treatment significantly reduces hcrt expression, restoring surface-like levels. (Pachón treated vs. untreated, p<0.0001; Pachón treated vs. surface untreated, p>0.635, n = 8, F(1,28)=21.28). (F) Fluorescent intensity per hypothalamic HCRT-cell was not altered with gentamicin treatment in surface fish, p=0.590, n = 4. In Pachón cavefish, HCRT neuropeptide levels are significantly lower following gentamicin treatment (p<0.0001, n = 4; 2-way ANOVA, F (1, 13)=0.0001 G. Gentamicin treatment has no effect on total number of HCRT cell number in either surface or Pachón cavefish (p>0.494, n = 8, F (1, 13C)=0.4967). (H–K) Representative 2 μm confocal images of the dorsal hypothalamic region in surface fish and Pachón cavefish immunostained with HCRT (green) and DAPI (white) (H) Surface control (I) Pachón control (J) Surface gentamicin K. Pachón gentamicin. Scale bar = 50 μm. This source file contains analysis of the effects of lateral line ablation with gentamicin on hcrt expression (Figure 6E), HCRT cell number (Figure 6F), and HCRT fluorescence levels (Figure 6G). Starvation selectively inhibits HCRT levels in cavefish. (A) Starvation does not affect hcrt expression in surface fish (p>0.832, n = 4) while hcrt expression is significantly reduced in Pachón cavefish (p >0.001, n = 4, 2-way ANOVA, F(1,13)=13.54)) (B) Fluorescent intensity in HCRT cells was not affected by 30 days starvation in surface fish (p>0.788, n = 4). 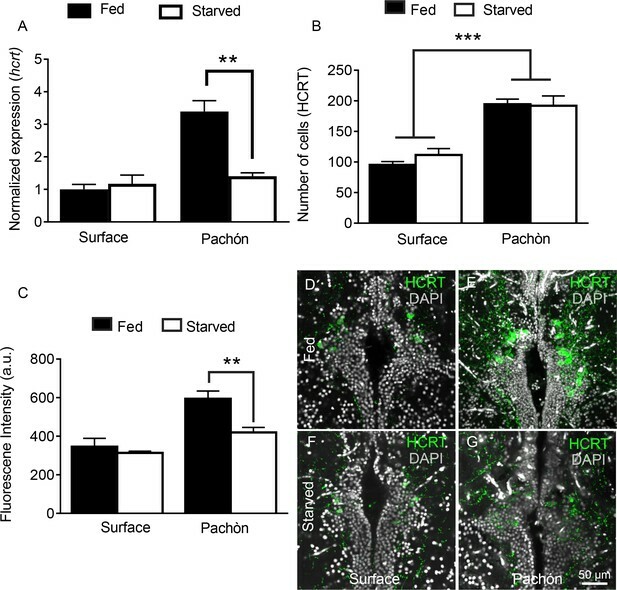 In Pachón cavefish, HCRT neuropeptide was significantly reduced following starvation (p<0.004, n = 4, 2-way ANOVA, F(1,12)=10.17)) (C) Starvation has no significant effect on total number of HCRT-positive cells in either surface or Pachón cavefish (Surface, p=0.452, n = 4; Pachón, p>0.979, n = 4, 2-way ANOVA, F(1,11)=3.65)) (D) Surface control (E) Pachón control (F) Surface starved (G) Pachón Starved. Scale bar = 50 μm. This source file contains analysis quantifying the effects of starvation on hcrt expression (Figure 7A), HCRT cell number (Figure 7B), and HCRT fluorescence levels (Figure 7C).